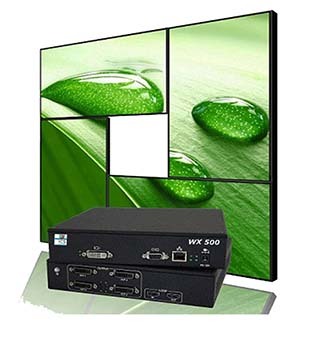 The WX 500 comes in two configurations the standard HDMI 1080P input version which is HDCP compliant and has four DVI at 1080P outputs and the 4K input versions which offer HDMI, DVI or Display Port input. 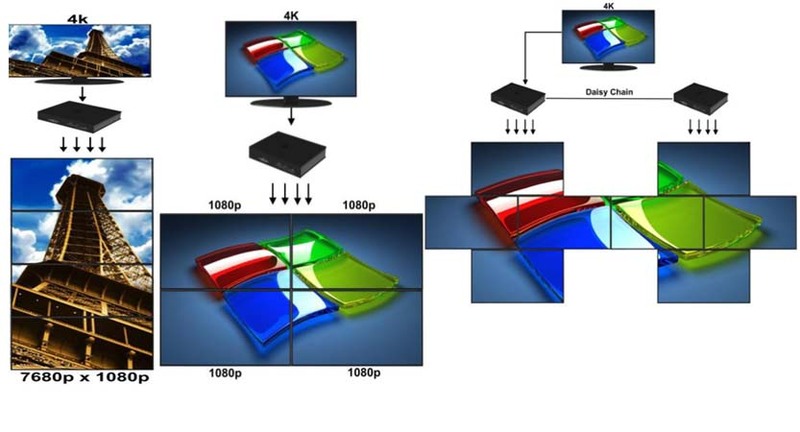 All three inputs can capture up to 3840 X 2160 and output four DVI's at 1080P each. Both the standard HDMI 1080P input unit and the 4K input units can be daisy-chained to create larger wall configurations. All the WX500 are fanless. The WX500 is the perfect solution for eye catching digital signage displays and offering the quiet zone with no fan noise. The WX500 can be daisychained for larger wall configurations. A great way to get true 4K displayed on standard 1080 P video wall narrow bezel screens. The input source can be divided across four displays, each with a resolution up to 1920×1200 @ 60Hz. Each output supports rotation of 90, 180 and 270 degrees and is able to crop the original input content arbitrarily. The resolution and frame rate of each cropped part can be upscaled and downscaled independently for each output. There are three input options DVI, HDMI and Display port. The 1080p HDMI version is HDCP compliant. WX500 fanless controllers can be easily configured via IP connection to a Windows based PC running WX500 management software. The Windows based software provides a user friendly GUI, greatly simplifying the system configuration. WX500 fanless controllers are able to run standalone without the connection to the control PC once configured. WX500 fanless controllers support all popular outputs including LCD, DLP and LED displays, along with projectors for edge blending applications. Note: To use the edge blending it would require your projector or other device to have edge brightening.